For the first time, the professional with the fresh steam generator is also available in XS size. 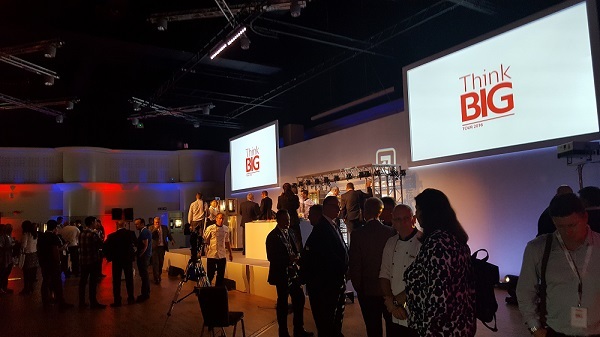 Under the motto of “Ideas change the world” and true to its slogan of offering maximum customer benefit, Rational AG presented its new SelfCookingCenter earlier today, at Twickenham Stadium. H&C News were there to witness a very well staged event that the first showing of the new SelfCookingCenter XS warranted. The SelfCookingCenter XS, which offers full Rational power and intelligence despite its minimal dimensions of only 55.5 cm deep, 65.5 cm wide and 56.7 cm high, has generated particular interest. It also has an integrated fresh steam generator. “Our units impress with their performance and precision, and together with the benefits of the fresh steam generator Rational represents top food quality and we make no compromises in this regard. We are therefore very proud to have developed, together with our physicists, engineers and chefs, a SelfCookingCenter of this size, which not only supplements our successful range of units, but which will occupy a class of its own within the market,” says Götz Sauer, Executive Vice President, Rational AG. The larger units from the SelfCookingCenter series are also certain to make a convincing impression. Many new functions enrich the new generation and make them even more economical, than previous models. With the SelfCookingCenter XS, Rational has succeeded in expanding our already successful range with a 2/3 unit, which only needs minimal space of 0.2 m3. However, the now smallest unit in the SelfCookingCenter family is in no way inferior to the larger units in terms of features and performance. This is because the SelfCookingCenter XS is equipped with a fresh steam generator and has all the familiar assistants such as iCookingControl, the intelligent support for the chef; iLevelControl, the assistant for optional mixed loading; HiDensityControl, which guarantees top food quality through maximum performance and precise regulation of cooking cabinet conditions, as well as Efficient CareControl, the automatic cleaning and descaling system. This means the SelfCookingCenter XS is ideally suited to use as a station unit in à la carte, in supermarkets, petrol stations, cafés and coffee shops, or indeed any situation where space is at a premium; as well as the first or additional unit. Whether this is a built-in solution, wall-mounted or standalone unit, the new SelfCookingCenter XS will find a suitable place anywhere. In addition it also grills, steams, pan-fry, gratinates and bakes all food gently and with perfect results. This will produce delicious snacks, take-away dishes and baked goods, as well as healthy lunchtime dishes. As an option, a high-performance and elegant circulating air hood to match any design and application, which can also be used in front cooking areas and ensures optimal visual integration. A full range of cooking accessories in the appropriate 2/3 size provide optimal support for the preparation of all types of foods. These include the grilling and pizza tray, the cross and stripe grill grate for grilling vegetables, steaks or fish, the roasting and baking trays for bread rolls, Danish pastries, pan-fried and breaded products, as well as the Multibaker, which is ideal for fried eggs, omelettes and hash browns. At first glance, the innovative design of the control panel and the more energy-efficient triple-glazed door with integrated LED lighting is what is most striking in all units. The triple glazing with cutting edge heat reflective coating significantly reduces energy losses through the door and further reduces overall energy consumption compared to the previous model by up to 10%, which saves energy costs and is environmentally-friendly. For cleaning, the panels are easily opened and closed, which effectively prevents the usual dulling in triple glazing. The LED lighting integrated in the door along with the interior lighting provide food-safe and extensive illumination of the food, allowing kitchen staff to visually monitor the food during cooking, as well as being attractive and appealing to customers. The start screen has also been modified and thanks to the faster CPU, the new generation SelfCookingCenter units are now even more convenient to operate. Rack signalling, whereby a blinking LED light signals which rack needs to be loaded or unloaded and when in iLevelControl mode is another new feature. This further simplifies the use of the SelfCookingCenter and provides even more support for inexperienced kitchen staff to safely and quickly unload finished food. Rational customers can also look forward to many other optimisations in the new generation of units. These include the new and improved cooking cabinet gasket, which promises a 2.5 times longer lifetime, even in continuous operation at 300 degrees Celsius. 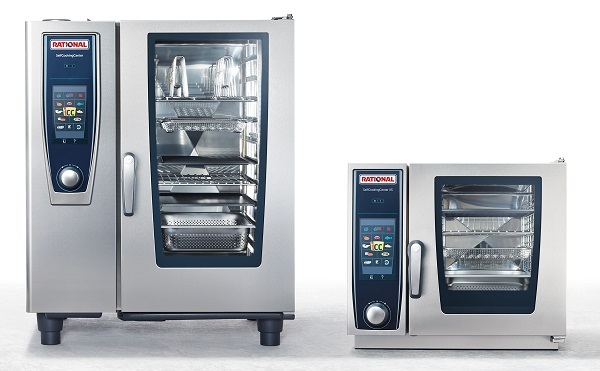 New generation SelfCookingCenter is now available as the XS version in unit sizes 6 x 2/3 GN and in the familiar unit sizes 6 x 1/1 GN to 20 x 2/1 GN from RATIONAL dealers. The SelfCookingCenter XS is available in the electric model, and all other units are available as electric or gas models. Anyone interested who would like to see the unit for themselves live and experience it with all their senses can attend a free and no-obligation cooking event offered by Rational. Contact us on: 01582 480388 to enquire about dates or make bookings directly here. Rational has provided additional information on the SelfCookingCenter units here.